I got this book from WritersMelon for my honest review. This is a true inspiring story of the author and his struggle with life. He struggled in almost every part of his life, but when his life seemed to be falling in place, his beloved wife left him halfway and her last word, ‘You are the best husband.’ gave him the strength to live with. He decided to pull off all her unaccomplished duties and made it a target to thrive for the rest of his life. Told with frankness and doses of humor this heartwarming tale of a boy and a girl who never gave up on their love in face of the many blows that life deals them ends on a bittersweet and poignant note as Ajay comes to terms with the biggest lesson life has to offer. 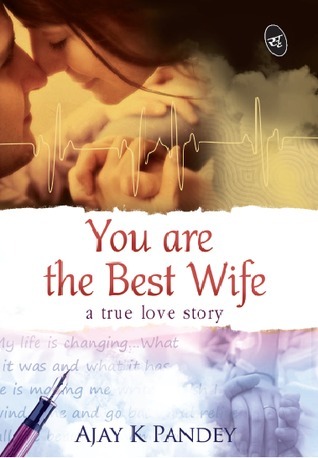 ‘You are best wife.’ is Author’s story—a story of how he lost his wife, his nerve-wracking and unimaginably terrifying journey through denial, resentment, and depression to, finally, acceptance and forgiveness. ‘Honest and straight from the heart’ is the only phrase that comes to my mind as I start this review. Reading the blurb, prologue and about the author, it was known that it’s someone’s true story and a debut effort, so I wasn’t looking for a literary piece. Anyone’s real life story, who is not a celebrity doesn’t generate interest immediately, but I was hooked the moment I began reading about college days, ragging, and heady emotions associated with that period. It was as if I have been transported back in time. Author has converted his simple, everyday story into an engaging read for almost the first two-thirds of the book, and the rest into an emotional, heart-wrenching saga. After one-third of the book, he seized to be an author for me and became more a human being, a fellow student, a colleague, a friend. So I have decided to review the book in two parts; one for the loving son and husband and the other for the mechanics of book as a product. Bhavna was an exceptional girl with a large heart and this book is like an ode to their love. It takes exceptional amount of courage and determination to pen something like this. As it is difficult to relive the moments with your loved ones who are no more, and thinking about the good times also brings back the ‘have nots’ or ‘have beens’. The protagonist has done a commendable job of pouring his heart out on the plain paper, and I salute him for this. I loved the way he has written the book—taking potshots at himself, his thinking, his reactions to the events happening around him. The narration of events, though linear, many a times makes you smile, and also tear-jerking emotional. The end lingers on the mind for a long time; fathoming and questioning the mysteries of destiny and fate. Coming to the book; it is well executed. Narration in first person is simple and engaging. There were some places where I think the editor should have paid more attention to phrasing of certain thoughts. In India we have a certain way of saying/thinking. We tend to think in Hindi and literally translate it in English, which doesn’t fit into the context correctly. There were a few mistakes like these which don’t gel well. The one star that I have taken away from the rating is for this very element. All in all a very emotional story and I would recommend it to all.